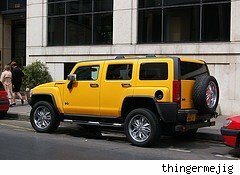 After a near-disastrous occurrence during the filming of a newly-planned General Motors (NYSE:GM) ad campaign, "Hummer Virgins," the agency in charge has shut down filming in Bhutan. An unnamed source from within GM stated that the company has shelved the idea, pending review. Filming for the planned ad campaign began near Thimphu, Bhutan, ("Land of the Thunder Dragon" ), where farmer Paro Tshering, who had never been behind the wheel of a motor vehicle, was given a Hummer 3 to test-drive. Cameras followed him as, after puzzling over the vehicle for over an hour, he carefully hitched it to his yak and began to pull the vehicle toward his rice field. The producer stopped the farmer as he was preparing to pump the cabin of the car full of water to haul to the field. A long conversation between interpreter, producer and Paro Tshering ensued before the farmer was finally placed behind the wheel of the Hummer. After being shown how to start the vehicle and shift it into gear, the farmer unexpectedly started the vehicle and shot off, his foot to the floorboard and hands clasped before him in a reverent, prayer-like posture. Luckily, his foot slipped from the accelerator when the vehicle bounced over a boulder, coming to a halt only a few meters short of a thousand-foot drop into the Mo Chu River. More training ensued. Finally Paro Tshering, after a number of short trial drives, indicated that he understood how to operate the vehicle. As the producer turned to inform the crew that they were finally ready to resume filming, Paro Tshering took off again, this time in reverse. The crew watched in confusion as the farmer, waving gaily at them all the while, disappeared in the distance, backing toward Thimphu. After waiting in vain for three days for Paro Tshering to return, the crew packed up its supplies, including the Land Rover that was to have served as the lesser competitor in the ad campaign, and returned to the U.S.